South of Sheffield is rough and lonesome country. Part of it is now a new natural gas field. Watch out for the bumpgates -- if you do not know how to go through them, you will put dents in your vehicle! The roads are gravel and are travelable except after a rain, when the roads sometimes get washed away. 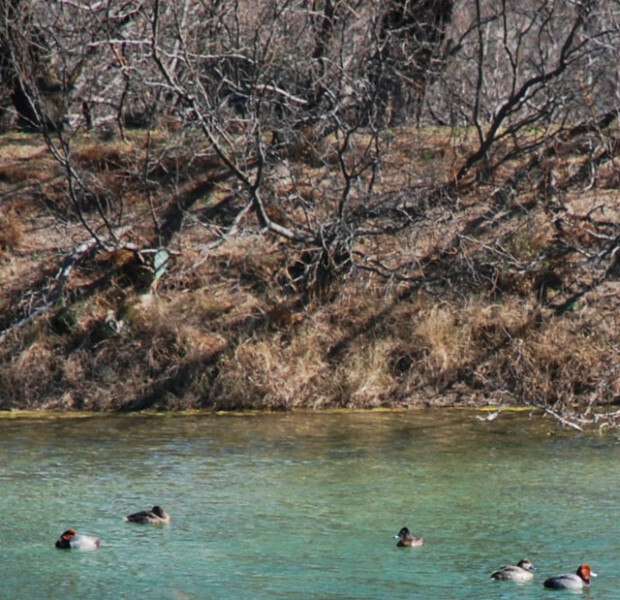 Independence Creek, 22 miles south of Sheffield, is a beautiful spring fed creek. 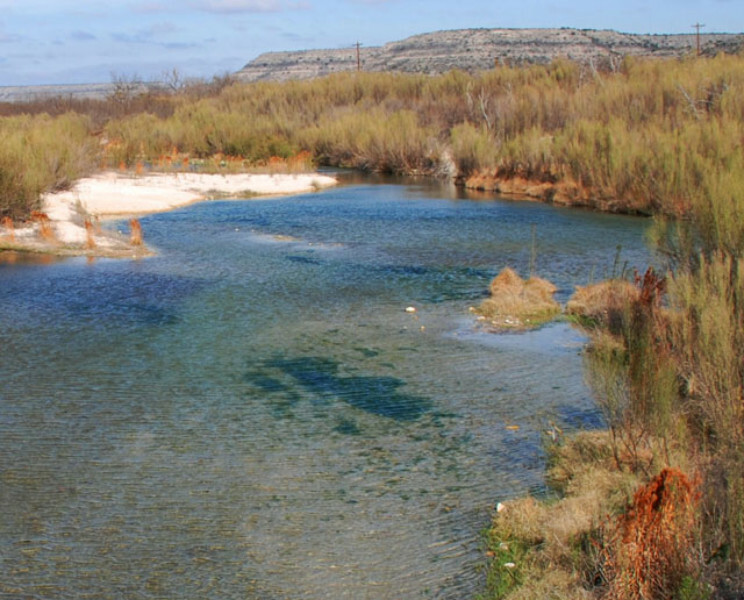 The Texas Nature Conservancy owns the land below the bridge. To visit, contact their Ft. Davis office. 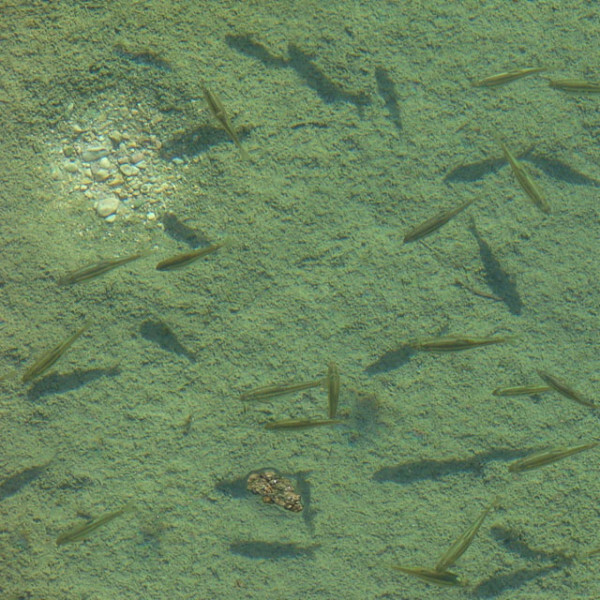 The creek was scoured clean by a flood in 2004. 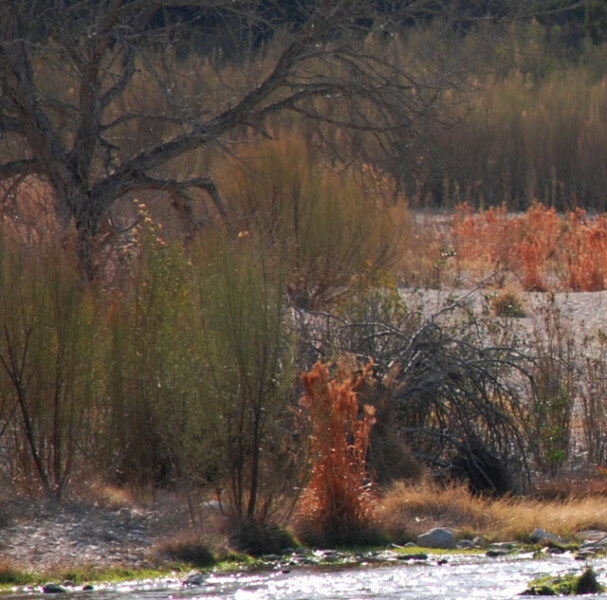 The seepwillow has already colonized the gravel bars, providing shade and cover for wildlife. 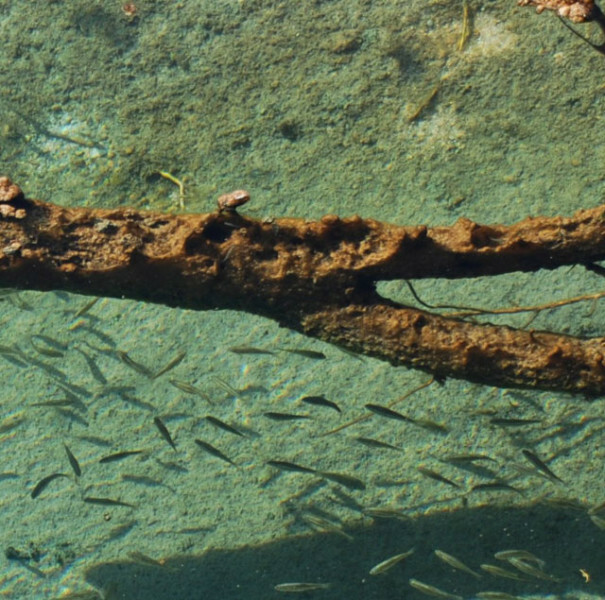 A log in the water provides shade for sunfish. Male sunfish scrape the rocks clean of algae, preparing a site for the release of the female's eggs. He chases away all suitors, and defends the young. 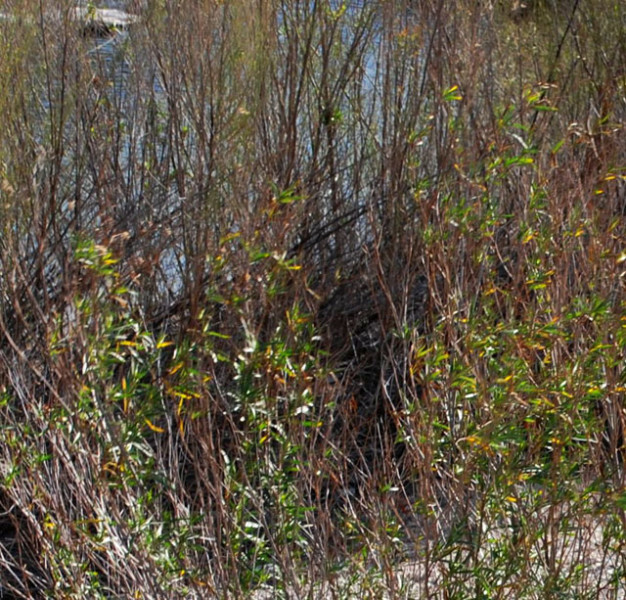 Red Bushy bluestem is bright under a nogalito (desert walnut). The creek's rapids glint in the sun under the seepwillows. 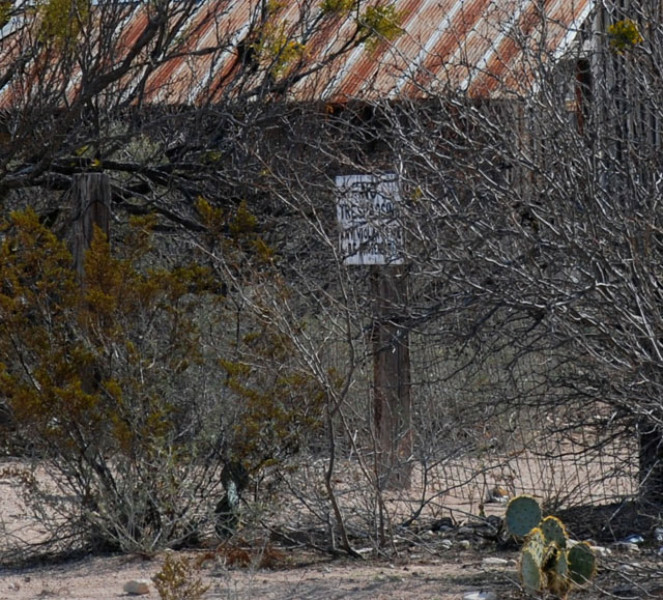 Pumpville is only a few houses, hidden by brush and protected by no trespassing sounds. Railroad workers often are there at the siding. 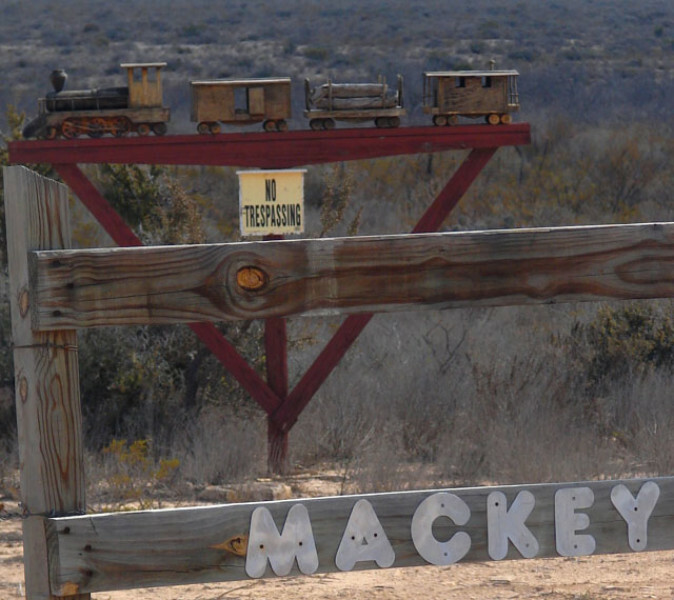 A few miles north of Pumpville, the Mackey house has a quaint gate. 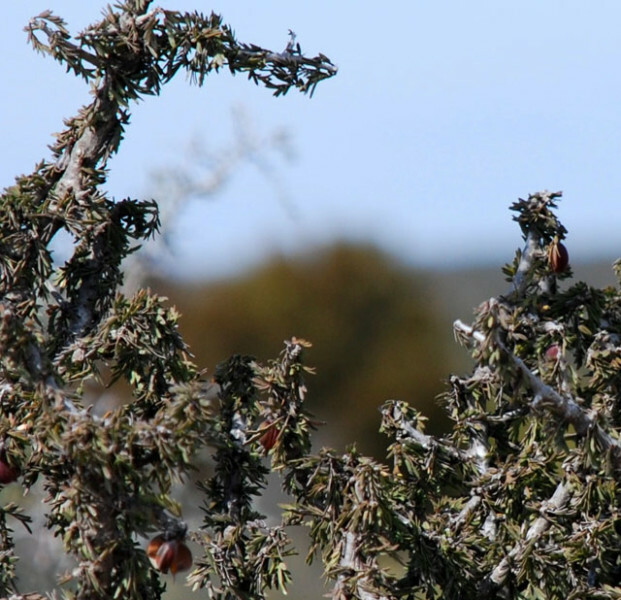 In the desert brush country, the javelina bushes were just budding out. 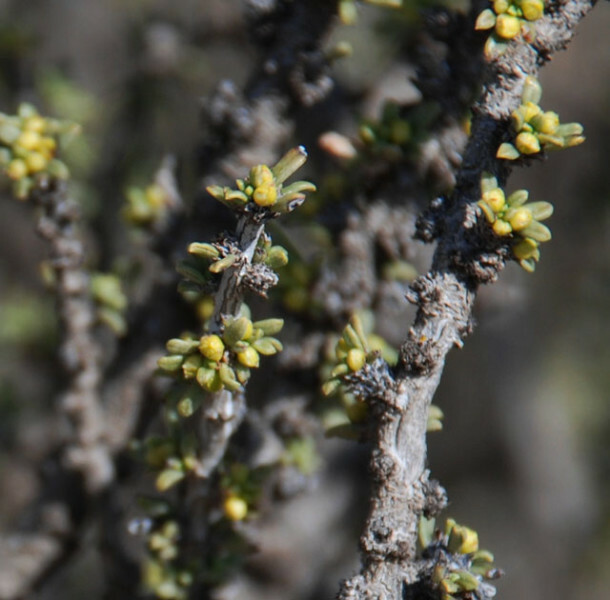 Guayacan, a strange angular shrub, is another of the Pecos Canyon brush country plants. 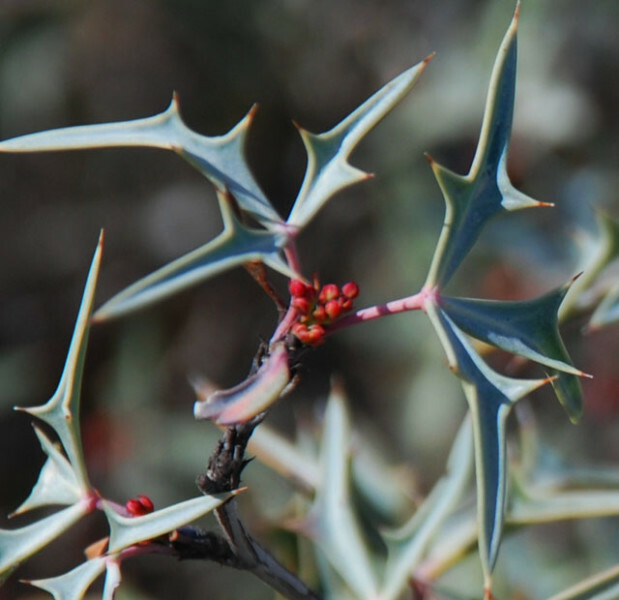 Paired red seeds are in peculiar pods. 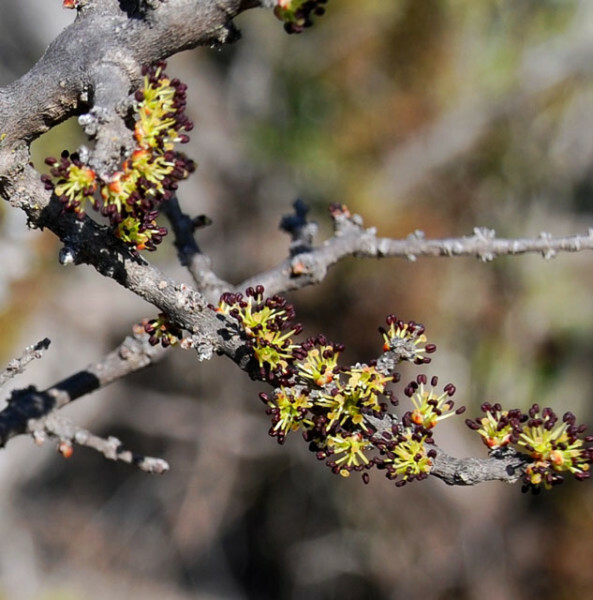 Algarita was beginning to bud on February 13, long before it does in Midland! ...in bloom like this one. 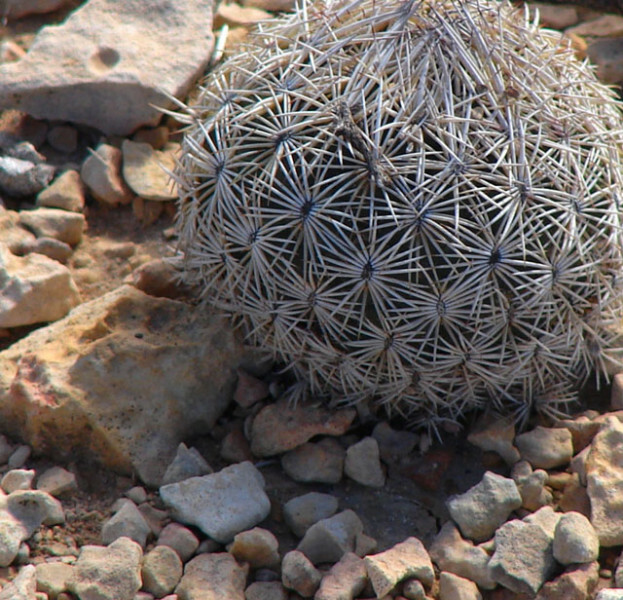 Spherical cactus were commonplace underfoot. 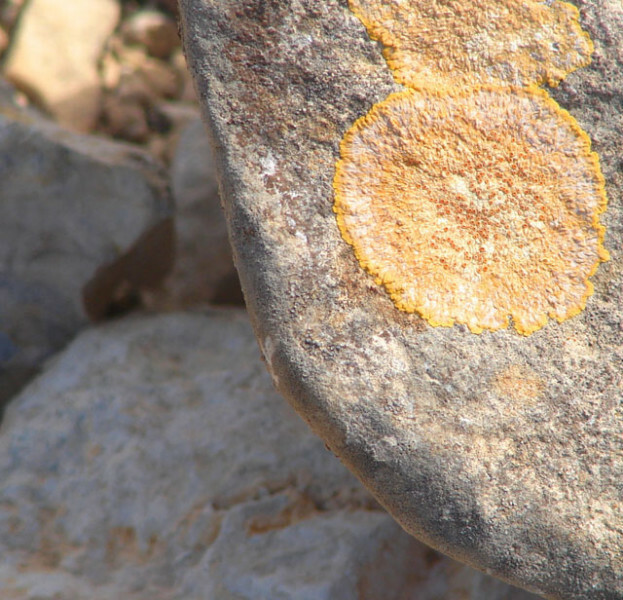 The rocks grow lichen - including this startling orange "species." 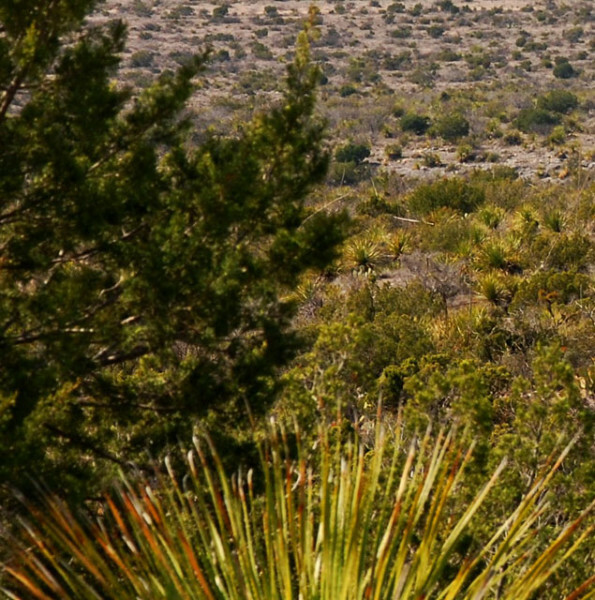 The desert brush landscape turned to juniper dominated hillsides, the "cedars" interspersed with plenty of sotol. 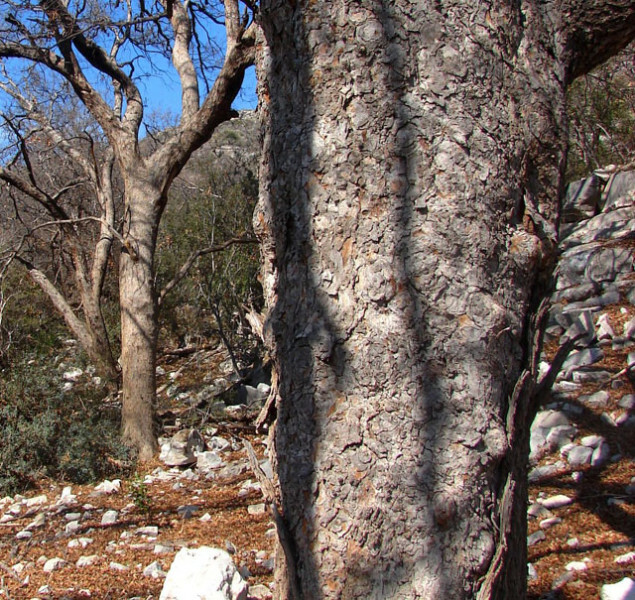 At the head of Geddis Canyon (the man it was named after spelled his name Geddes) the bedrock bottom had several tinijitis (small tinajas). Both words are what a solid rock pothole is called... and the tinijitis are the very small ones. Tinijitis and tinajas are important for wildlife watering... some of the bigger tinajas will hold water for months. 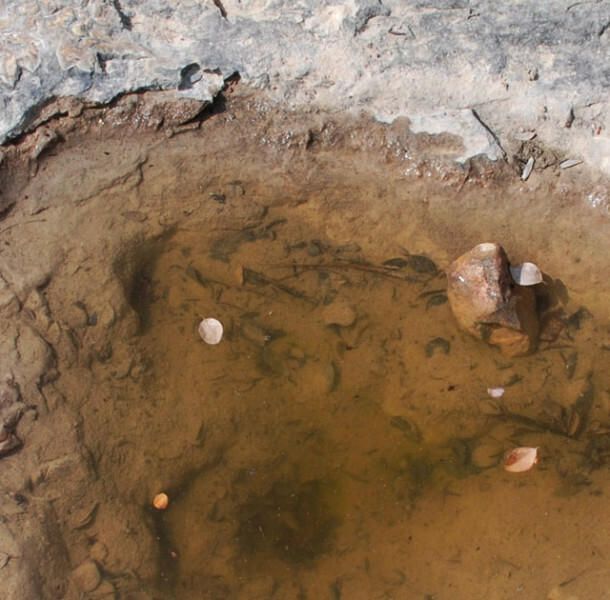 At the tinaja by the side of the road, silt had left a place for visitors to be recorded. 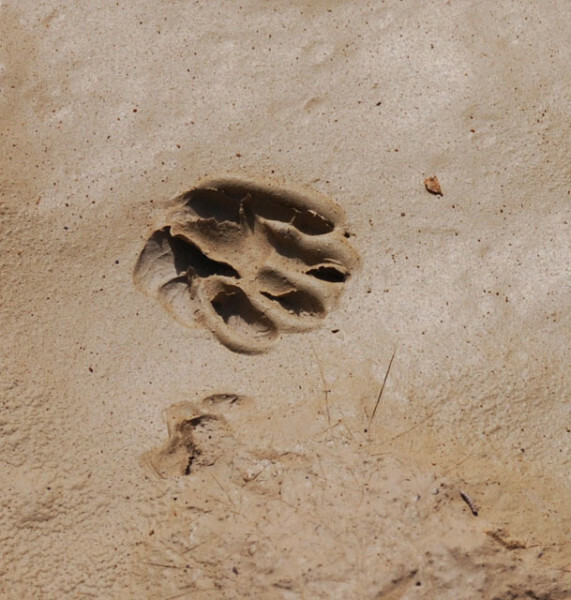 Was this the track of a ringtail? 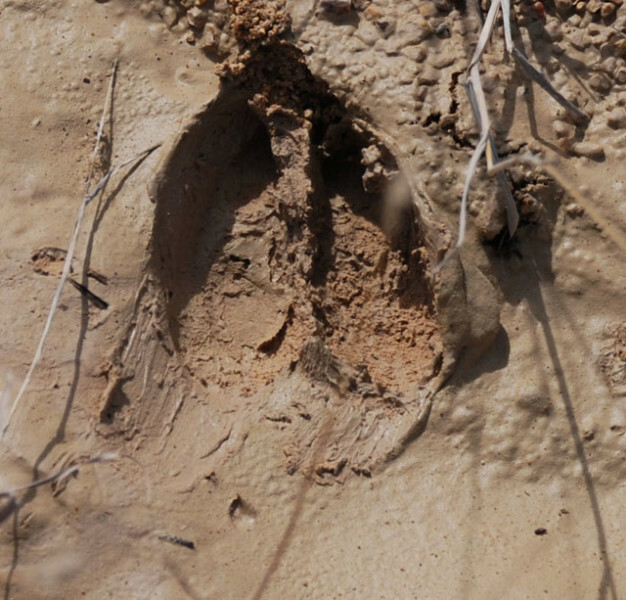 Was this a whitetailed, or a mule deer? 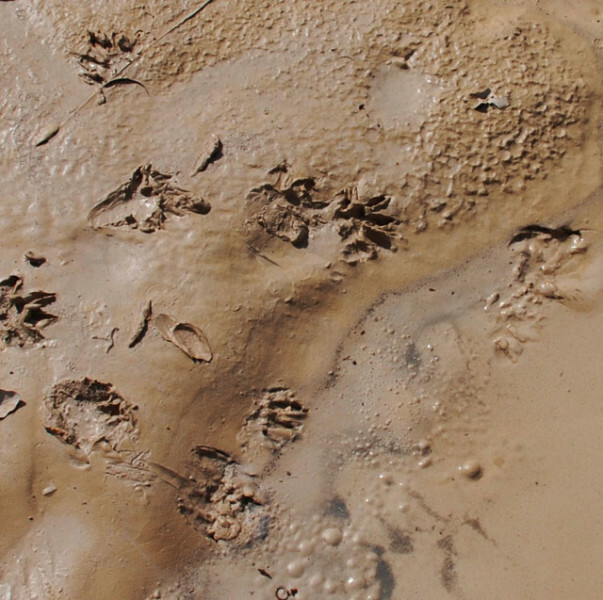 The silt was covered with tracks. Further up the draw, the bedrock disappeared and the way became thick. If a person tries to go upslope, they have to step carefully! 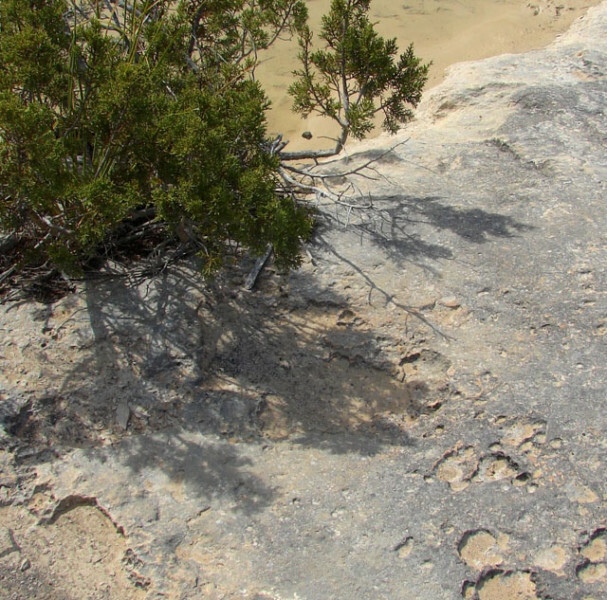 Back at the tinaja, the rock was eroded into a rough moonscape. 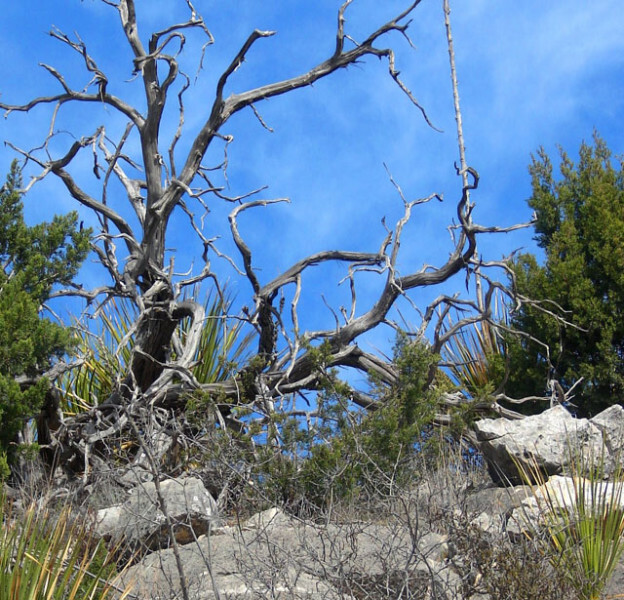 A small juniper overhung the water. 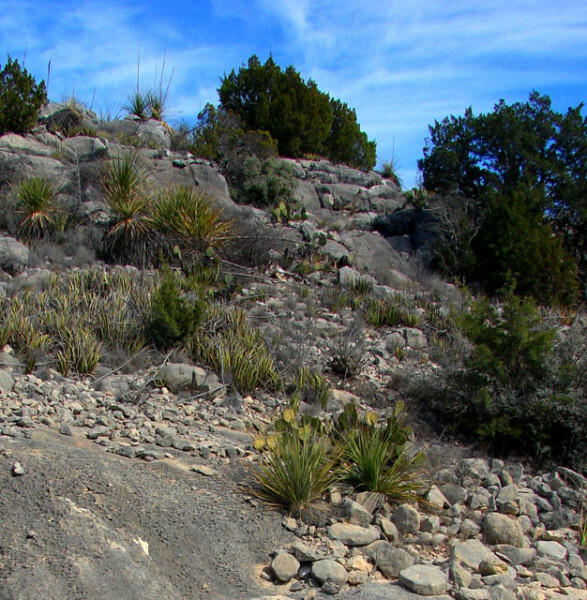 Looking back up the slope, a person can see plenty of sotol among the juniper and rock. Up on the slope a claret cup cactus was discolored by the cold of winter. 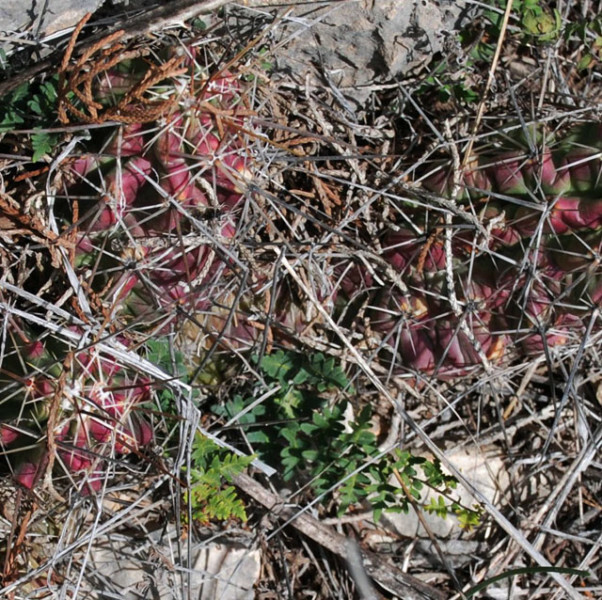 A cloakfern was beginning to grow from the heart of the cactus. 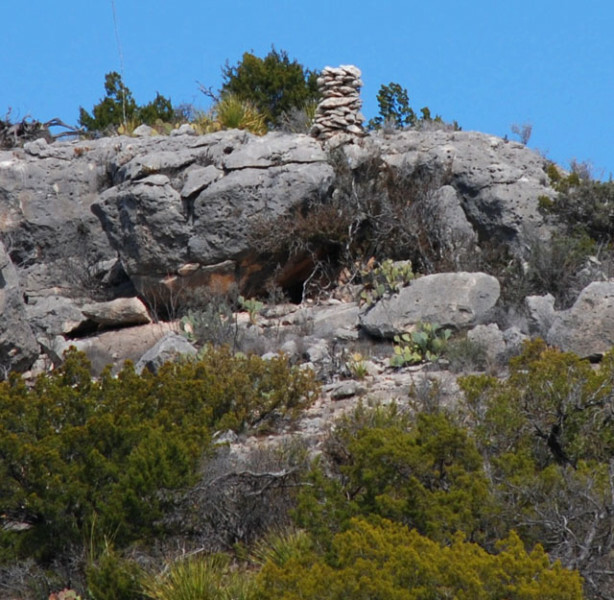 On top of the canyon wall, someone had built a cairn. More than likely, it marked the rock shelter just below. 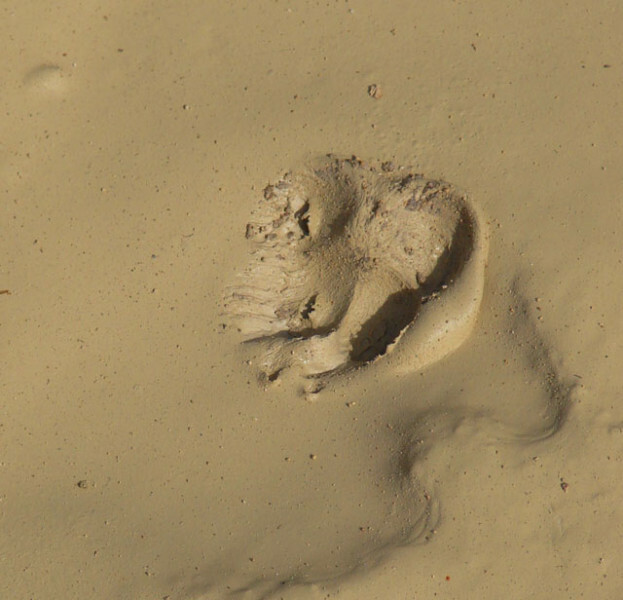 Pothunters and arrowhead hunters have scavenged many of the sites in the region, but professional archaeologists have documented dozens of sites in the region. 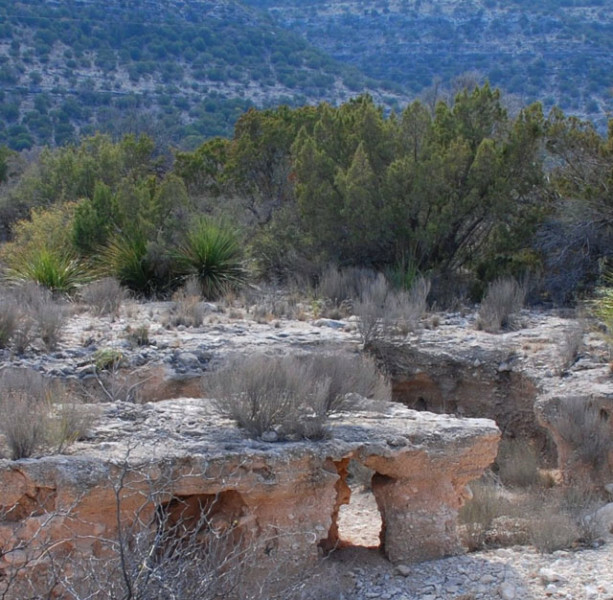 Pecos River "Cave Dwellers" were in the region at lesast 10,000 years ago. 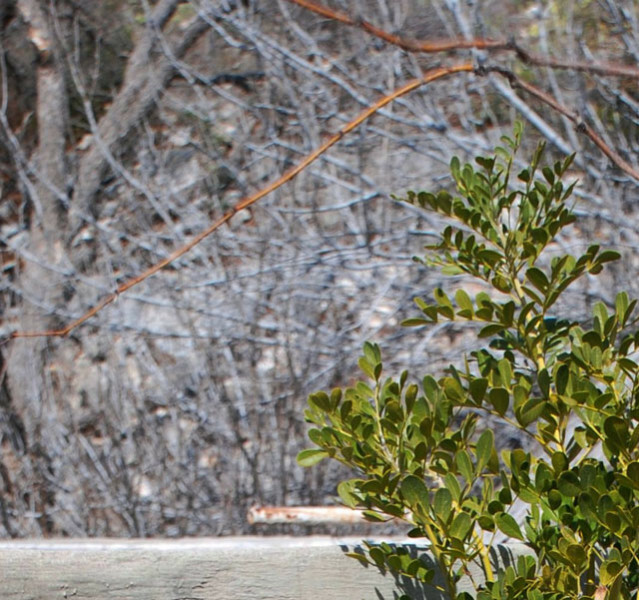 A mountain laurel had grown to the top of a 6 foot stock tank. 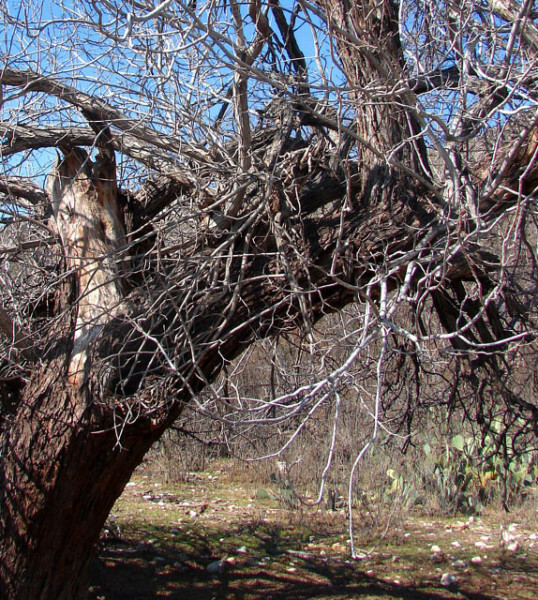 The red is a mesquite branch, and in the background is the macabre shape of a huge old nogalito. 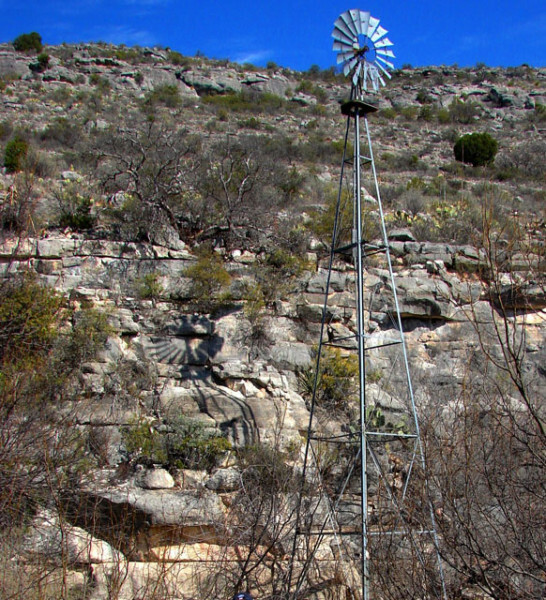 A windmill marks the site of the old Geddis Spring. 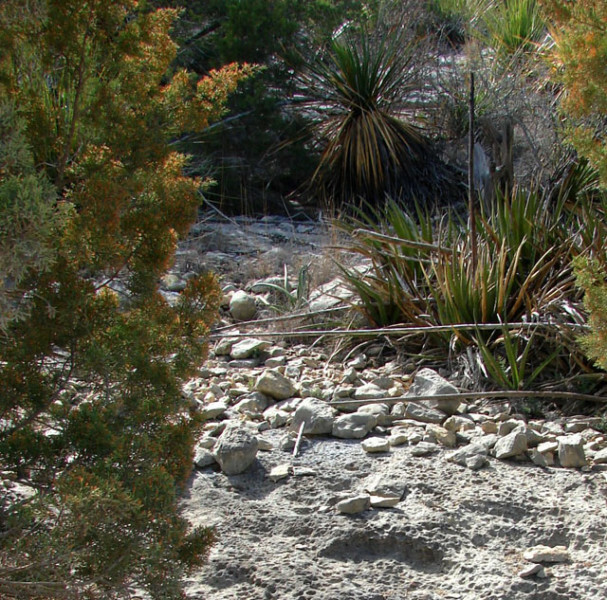 The spring still trickled water in the 1970s. 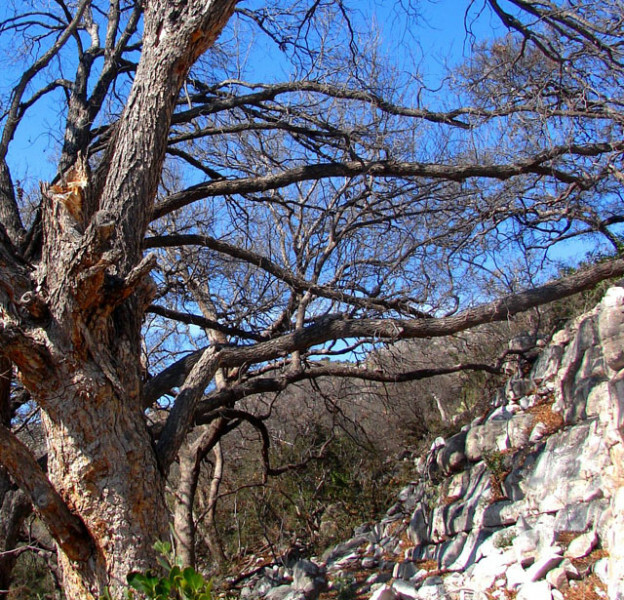 A huge black willow grew horizontally along the cliff wall. This is the largest nogalito that Sibley Executive Director Burr Williams has ever seen! 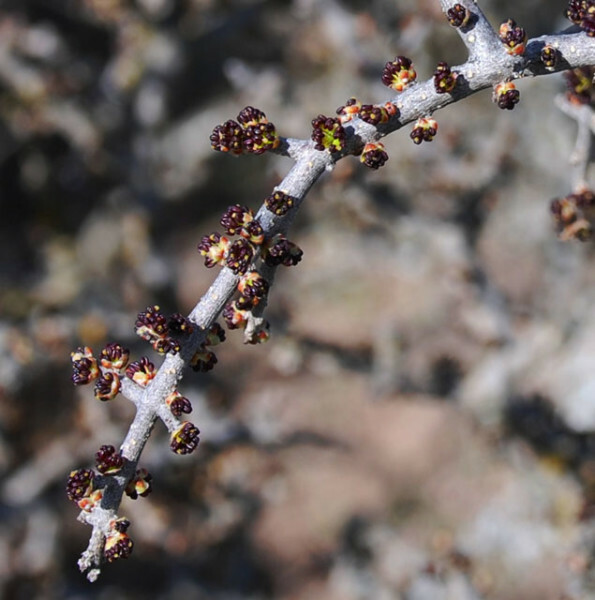 The tiny nuts of this wild walnut are edible, but very small and well protected by a hard nut. 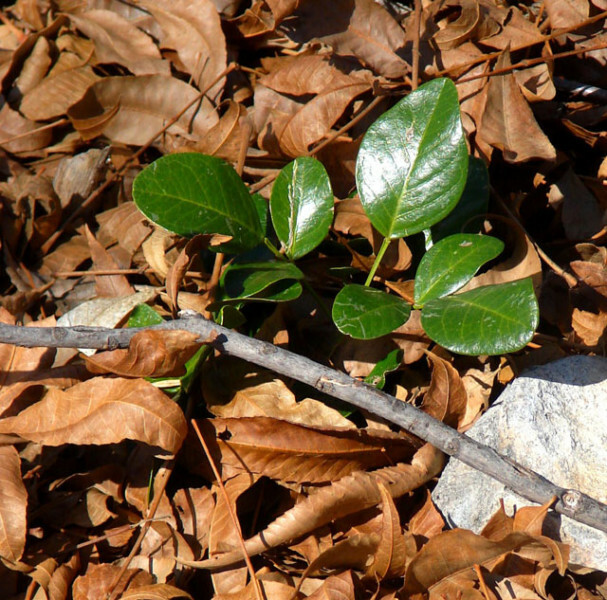 A seedling mountain laurel had germinated last year among fallen leaves - but of what type of tree? 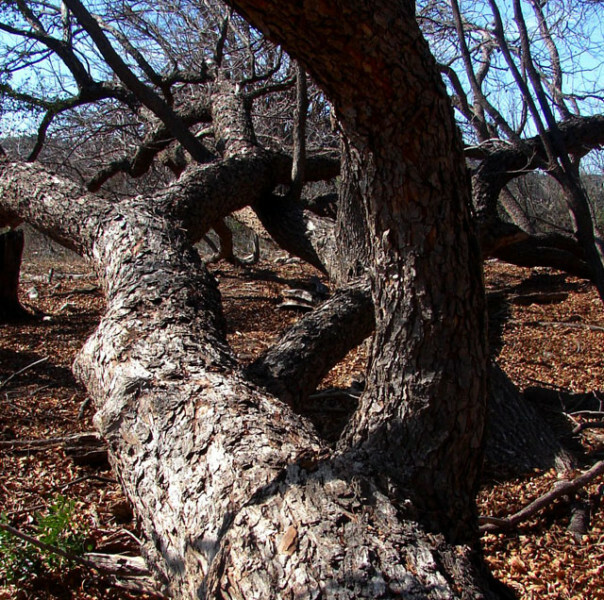 Williams and Cherry were amazed to find that the trees at Geddis Springs were pecans - and too old to have been planted by ranchers. It is a good possibility that Jumano traders planted them over 300 years ago! 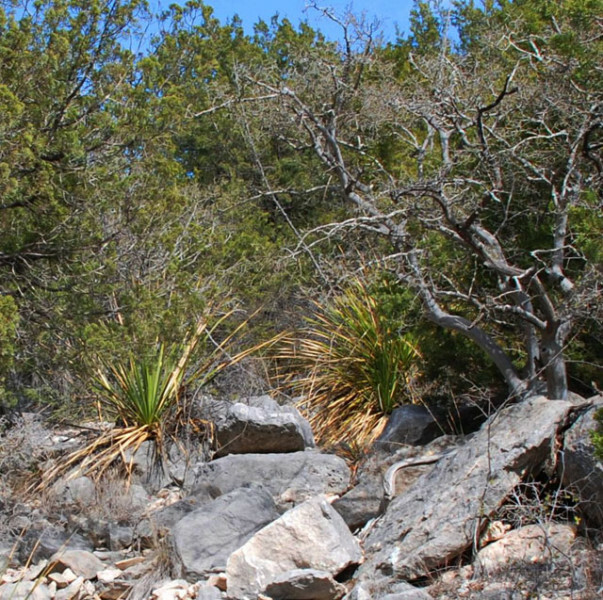 The pecans were 50 feet tall, up against the south facing cliff. 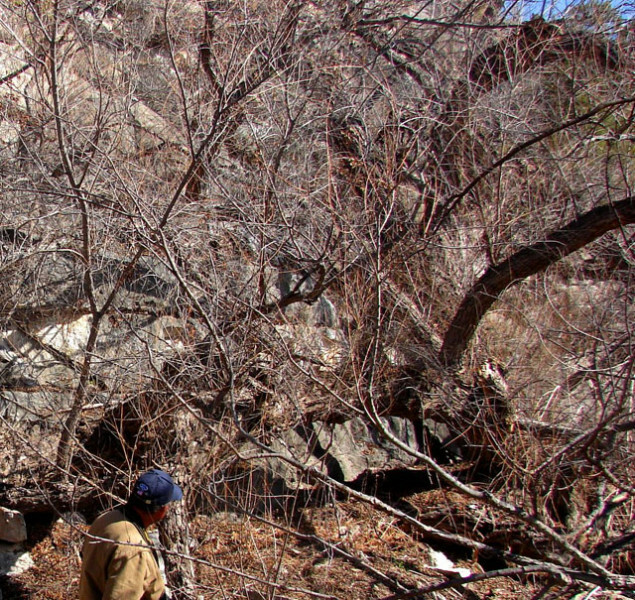 Near the confluence of Geddis Canyon and the Pecos River, a small natural bridge had been eroded in some past flood. 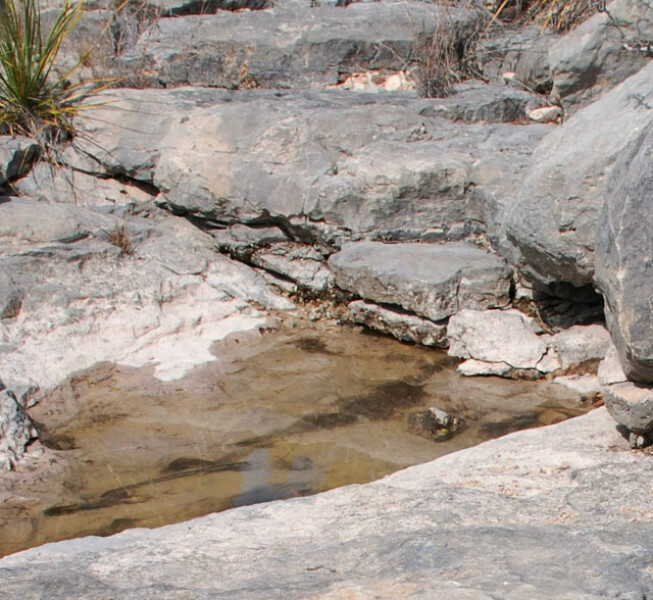 The rancher that lives at the confluence has built acequias to carry spring water to "fish ponds" on the river terrace above the Pecos River. Redheads and ringnecks floated peacefully.